Since the moth is considered a symbol of determination as it constantly tries to find light in any darkness, I just had to name this exquisite necklace DETERMINATION! 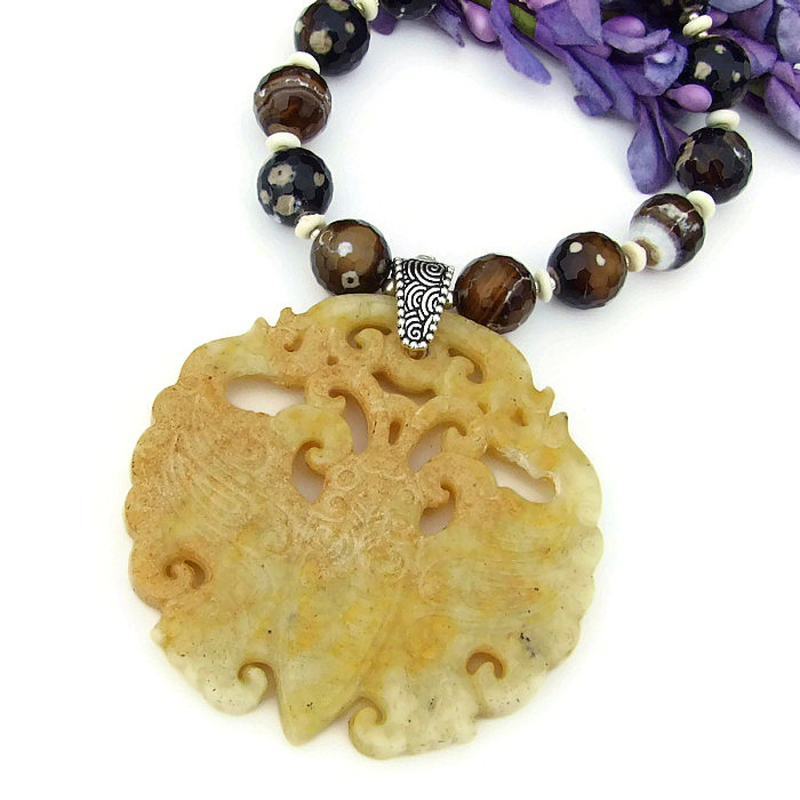 A perfect gift for the woman who loves to wear bold jewelry, the unique necklace features a large, two sided jade moth pendant, spotted fire agate gemstones and white bone discs. The beautiful cut out moth pendant was delicately hand carved on both sides from jade - just look at the detail of the moth’s body, wings and the intricate detailing around the cut out areas! 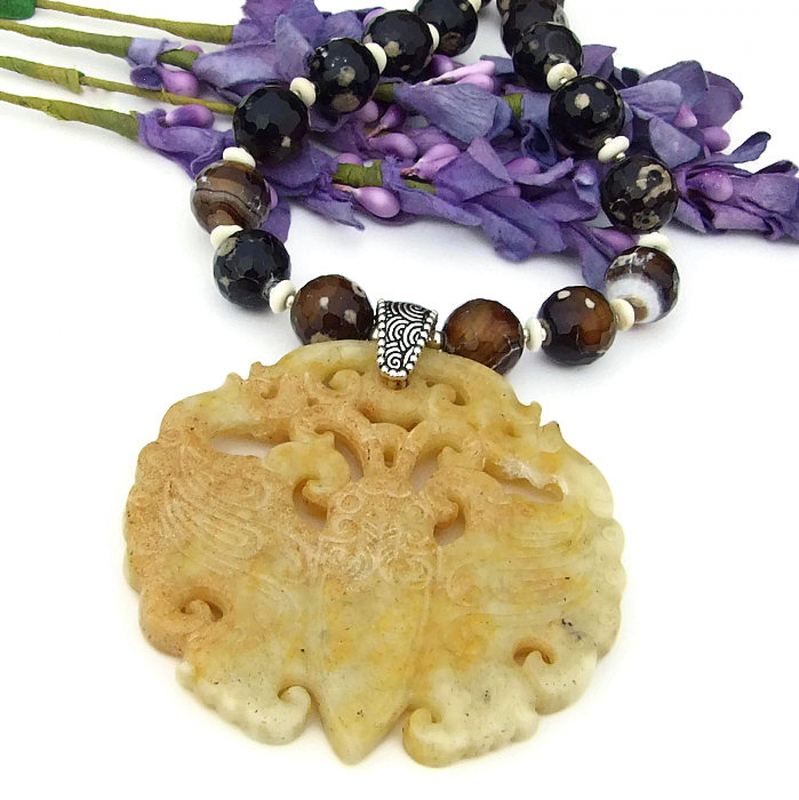 Since the pendant was hand carved, you can see that the right and left side of the pendant is not quite a mirror image, very similar but not exact. 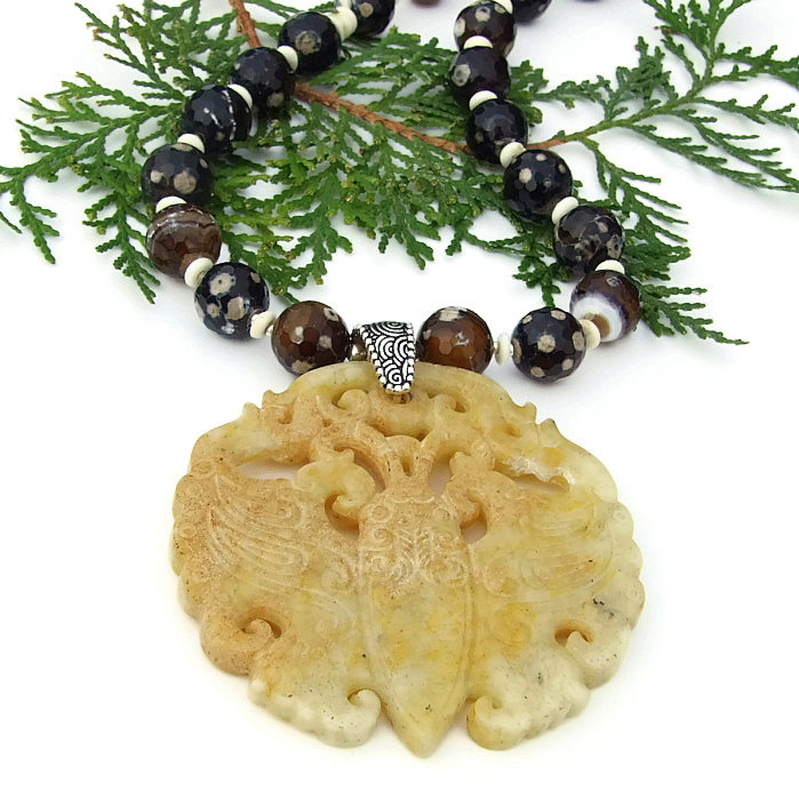 The jade pendant is a subtle creamy yellowish color ranging from very pale to darker with a hint of light rusty orange in places and speckles of black here and there. Because the pendant is two sided, you can decide which is your favorite side and wear it facing out. An eye catching lead free pewter bail with sacred spiral designs and a small dome at the top connects the pendant to the main body of the one of a kind necklace. 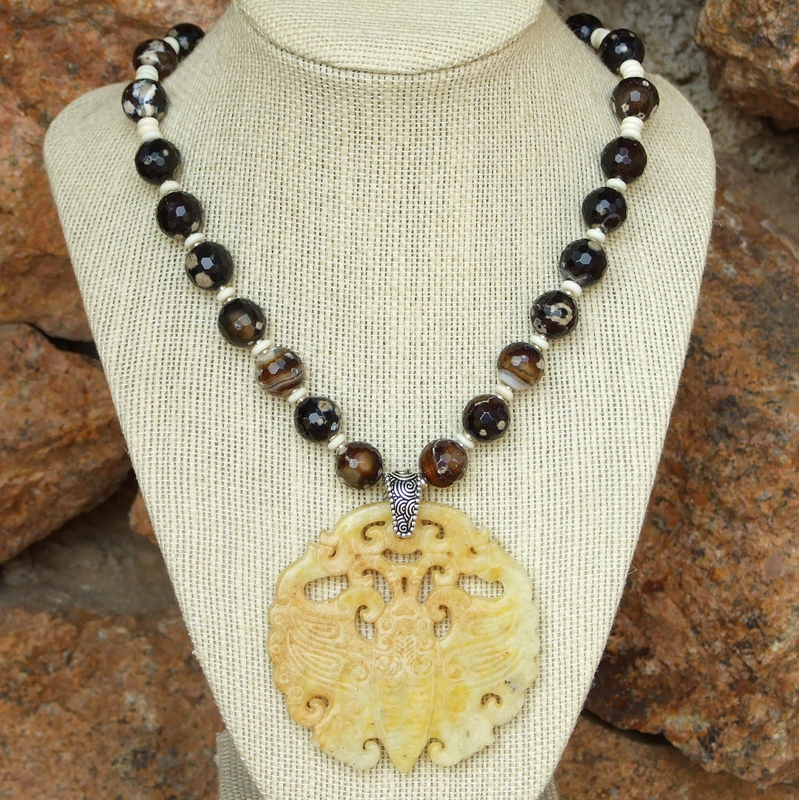 To perfectly complement the colors of the pendant, speckled fire agate and small bones discs were used. 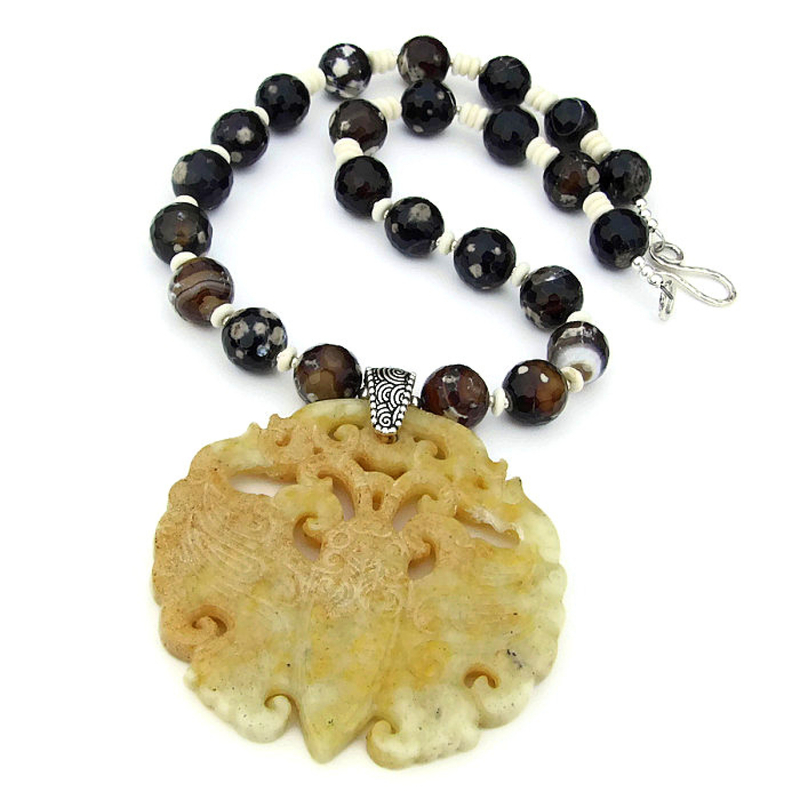 The speckled fire agate ranges in color from a rich root beer brown to almost black, each bead having various amounts of white dots and splotches. Some of the gemstones are translucent and seem to glow in good light; some of the agate is more opaque. 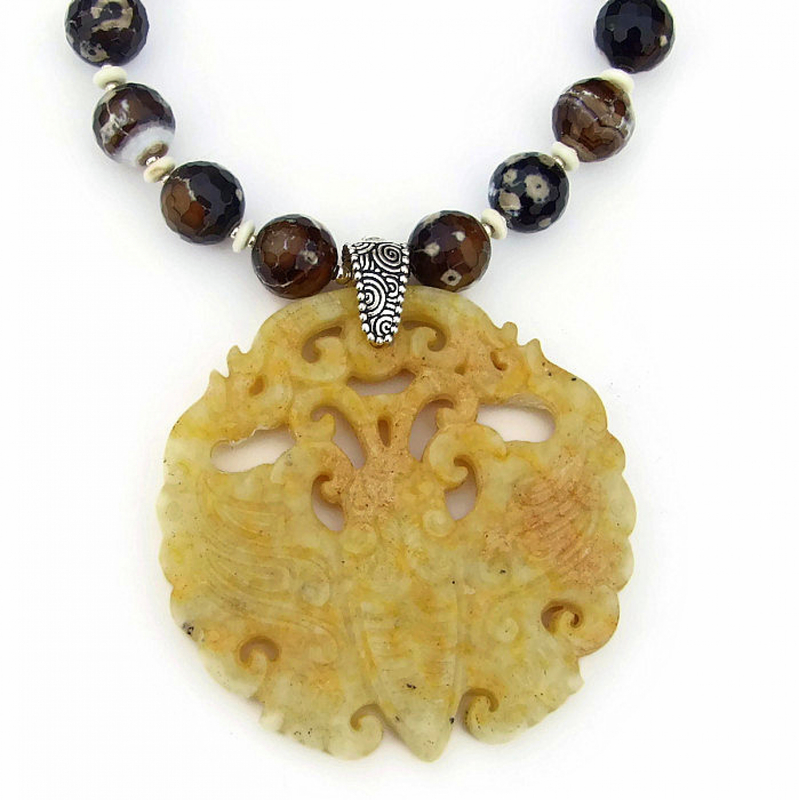 Because the fire agate is faceted, the necklace catches the light and sparkles with every move. 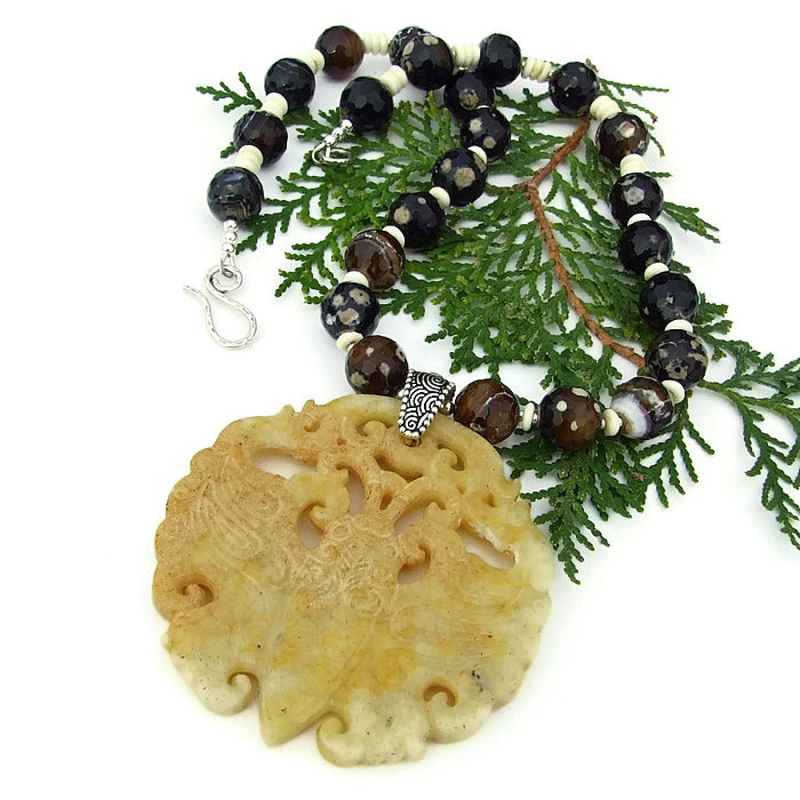 To play up the speckles and to give the necklace a sinuous feel, small white bone discs and sterling silver beads can be found between each piece of agate. The first seven at the front of the necklace ae separated by a single disc while the stones at the back are separated by three discs. 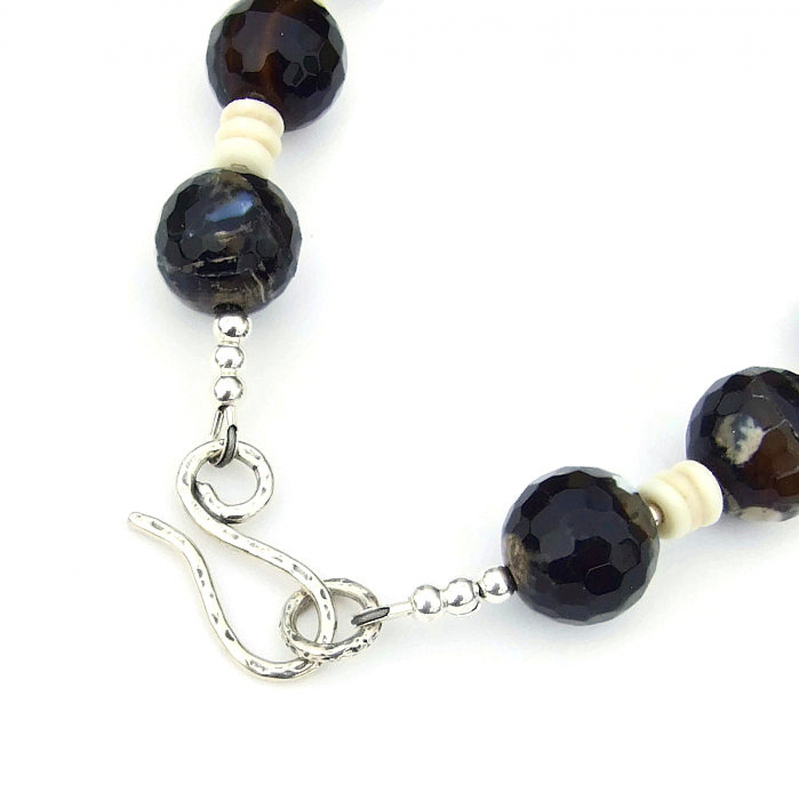 A gorgeous sterling silver hammered hook clasp set finishes the necklace perfectly. Carefully designed and handmade by Catherine of Shadow Dog Designs, the DETERMINATION moth pendant necklace was created for the woman who adores wear meaning meaningful artisan jewelry. 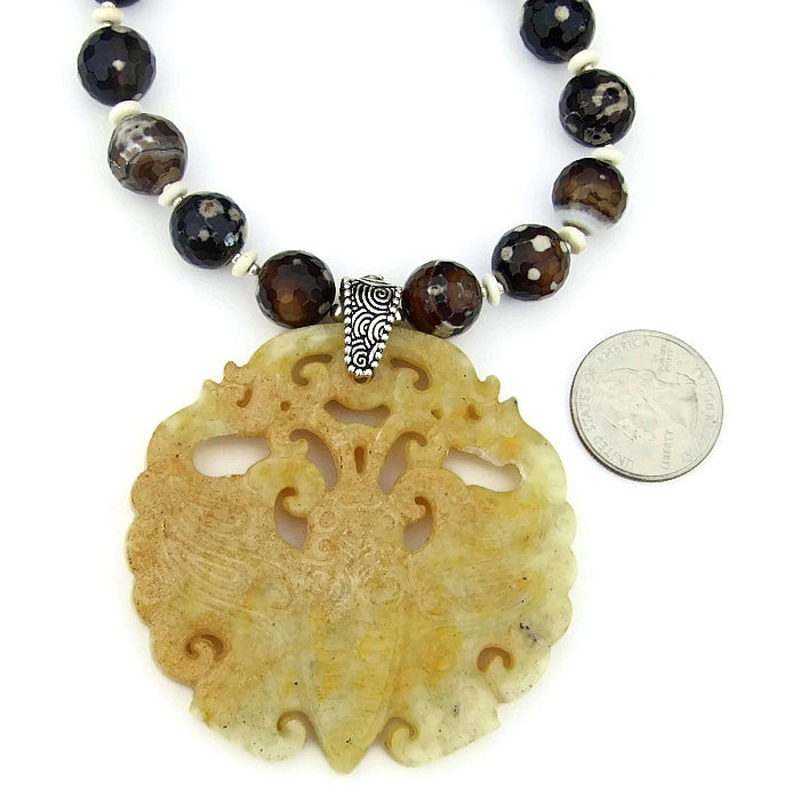 *** For a better understanding of the relative size of the jade moth pendant and gemstones used to create the DETERMINATION necklace, please be sure to check out photo # 6 for a size comparison with a quarter. A moth is a symbol for seeking out the positive in any situation, determination in finding the light in any darkness. Speckled Fire Agate is a stone of protection, courage & strength; it is said to help take the edge off of difficult events. 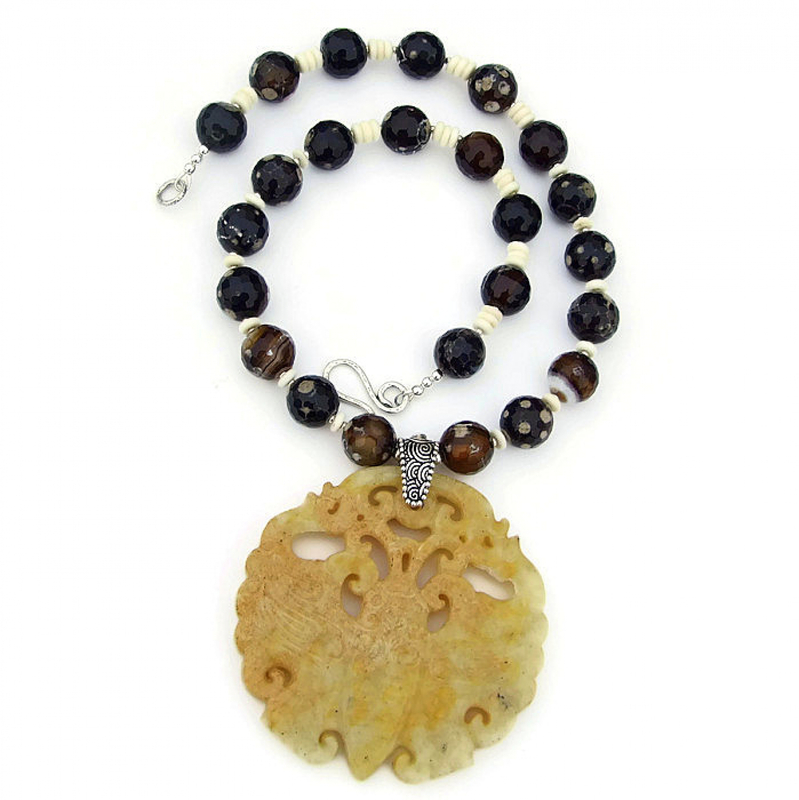 Bone is said to bring good fortune and strength. Pewter is believed to be very grounding, bringing the wearer back to reality. Silver is a metal of love and healing; it is a mirror to the soul, helping us to see ourselves as others see us. The DETERMINATION moth pendant necklace was carefully designed and handmade in a dog friendly, smoke free studio. The necklace will come with two informational drop tags: one with the piece's name; the other lists the materials used in the necklace and the language of the stones and metals. It will be carefully packed in an organza jewelry bag, perfect for gift giving to a loved one . . . or to yourself! *** Photos of my jewelry are taken outside in natural light. The colors of the items used to create my jewelry are extremely close to the actual color on my own monitor. Please be aware that not all monitors show colors exactly the same. The colors may appear lighter or darker on your monitor.